for sale NOS 55 carb. Do you know the application? This carb looks like a truck carb. No, trucks did not use 4 barrel. It's t-bird and car with automatic transmission. can be converted to standard trans in five minutes. check blue book page 324 line 17 = A 182 hp special also shows S code that is t-bird. FORD does not show the HOLLEY LIST NO. in cataloging (1074-1N). There is (was) no ASSEMBLY I.D. TAG on the carb? That will give you much more detailed info. So what is it for based on those numbers? !955 Ford MD and HD 272 engines in trucks used 4 barrel carbs. 182 hp special is a police application. No clue as to what the ‘Blue Book’ is. But to add to the confusion and straight from the Holley Specification manual, the List 1074-1 carbs (Ford #ECK-9510-T) were original equipment for the 1955 Ford and Mercury cars with the 292 engine. The ’55 Thunderbirds received the List #997, #998, #1077 and #1078 series of 4V carbs. As the carbs were updated during the year, the suffix numbers at the end of the List numbers would increase accordingly. 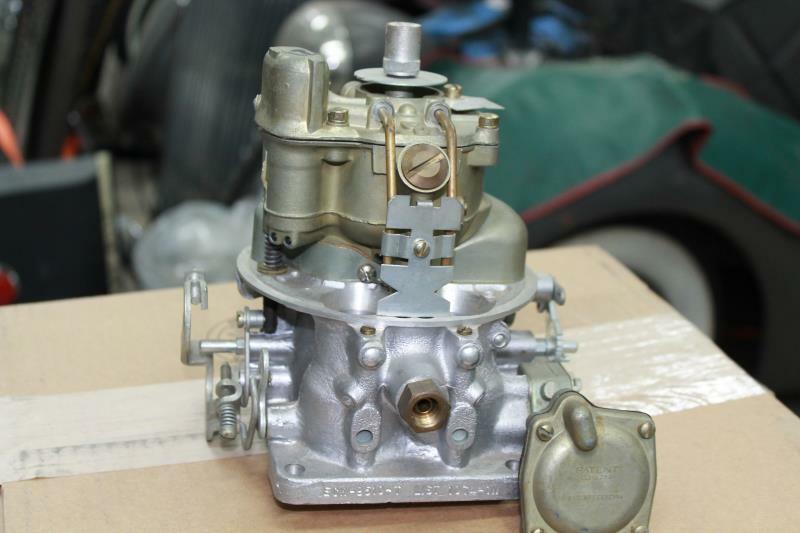 The 182HP 272 shared carbs from the Ford and Mercury 292 engines and the three carbs used on those 4V equipped 272 engines during the 1955 model year were FoMoCo part numbers B5A-9510-H, N, & R. There are specific date ranges for when each carb was being used. At least two of these numbers back track to being List 1074 carbs, I’d have to dig deeper to get the list number on the third carb. The 182HP 272 was the top engine choice a civilian could get in a ’55 Ford car or station wagon. If you could pull some strings or knew someone, you could order the 292 police engine for your Ford car. I’m aware of a ’55 Crown Victoria that was ordered with the 292 police engine by going outside of normal channels. The P code 292 was the engine delivered in ’55 Fords ordered for law enforcement or government agency use. As far as I can tell, the Ford 292 police engine was identical to the Mercury 292 engine but the Thunderbird 292 engine was different from these with different heads and carburetor. I still have the remnants of a ’55 Ford 2 door Mainline that is a P code car and it was originally a Game Warden vehicle. That P code Mainline had the larger 2” dual exhausts that was standard on the P code cars versus the smaller pipes that came on the dual exhaust Fairlanes with the 272 engines.